The wetlands behind the shoreline of the Saire valley are representative of many of the Conservatoire du Littoral’s sites. 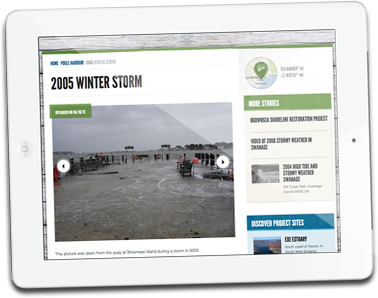 The phenomenon of tidal flooding is present here and raises questions in terms of the evolution of biodiversity on the site and management of the shoreline. This pilot site is located within the Manche department, to the east of Cherbourg, and extends from Cap Lévi to Barfleur Point.It is subject to regular erosion which cause breaches within the dune cordons and tidal flooding. In order to cultivate the agricultural land to the back of the dune cordons hydraulic structures (such as sluice gates and tidal gates, locally called nôs) were built at the start of the 20th century to drain freshwater and dry out the wetlands. There is currently a strong debate on whether to provide management measures adapted to the natural evolution of the wetlands, considering the evolution of the shoreline on the one hand and the financial aspects associated with the maintenance of Nôs on the other hand. The wetlands are of significant interest for their fauna and their flora and tidal flooding of these areas would modify the existing ecosystems. Potential plans for sewerage schemes in some of the neighbouring towns are another threat to this area (management of water quality in this environment). Studies on this site should help local stakeholders in thinking about the future of wetlands and help to develop tools for raising awareness. The Saire Valley is facing coastal erosion and tidal flooding. In light of this, major issues for the management of the natural environment include the loss of wet freshwater areas, the management of Nôs and the future of birdlife. Major issues associated with human activity concern sewerage, agriculture, landscape impacts and hunting. The main objective of LiCCo on this site is to raise awareness amongst local stakeholders of an alternative management approach and to develop a protocol for monitoring habitats and sediments. LiCCo will need to link with some of the ongoing initiatives on this site, especially the revision of its management plan and the rewriting of its Natura 2000 objectives document. LiCCo will benefit from the CdL management committee to involve local stakeholders. In 2012, the marine part of the Natura 2000 targets document will be developed by the AAMP and the ComitéRégional des Pêches Maritimes (CRPM). Tell us your story - how has coastal erosion has affected you?